Humane Vinyl Girth Equalizer buckle system adjusts automatically for best fit. 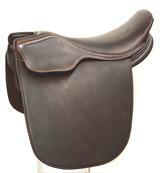 The inner wall of this girth has a non-slip panel installed for stability. Stainless Steel Roller buckles on both ends. Will not RUST! White with brown leather ends. Sizes: 38", 40", 42", 44", 46" & 48"